Notes: At last! Here’s how I used those figs. I threw this together fairly late one night when we realized we hadn’t eaten dinner yet because it seemed the easiest to make (hence the wonky looking photo). Wow, was this good. The figs, once cooked, were sweeter and had a velvety texture. (And really, is prosciutto ever not good?) 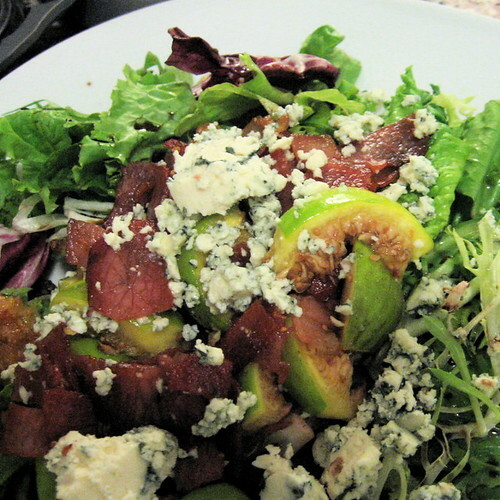 And then, the figs paired with the blue cheese… brilliant. Rating: The only meal I’ve made twice already, which is saying a lot. Oh, does this look good. I’m moving it to the top of my bittman list! i’m so trying this for dinner tonight. i have a boatload of figs just sitting around that i’ve been snacking on and wondered what to do with them to make them really exciting. presto! add pig! bacon (and/or prosciutto) make everything better.